We attended the Clipsal 500 for 5 days. This is the article for Day 2, the Friday the 27th of February. See below for the others. Friday brought out the weather that the Clipsal is famous for – 35 degrees with fair humidity made it fairly uncomfortable for everyone and most people were looking for shade. We were somewhat jealous of the Air Force and their large, air-conditioned tent. Numbers were up from Thursday and we handed out a lot of flyers to interested parties, many of whom indicated that they might attend the GM Day in April. The promo girls were out in force and were keen to have their photos taken with the vehicles. There was, of course, plenty of action on the track too, including the crazy ( Paris to Dakar rally style) trucks, which were lifting their front wheel off the ground when accelerating and making huge jumps – they were very popular with the crowd. It was great to have cold water available thanks to the RAAF, the heat certainly made that a necessity. There are some pics from the Ferrari display and the new LaFerrari, at a special price of around $1,000,000! This is a guest article, written by the daughters of our President, giving a unique view of their experience at the Corowa Swim-in this year. Being the biggest military vehicle event in Australia, Corowa attracts a healthy patronage and many of our members attend every year. 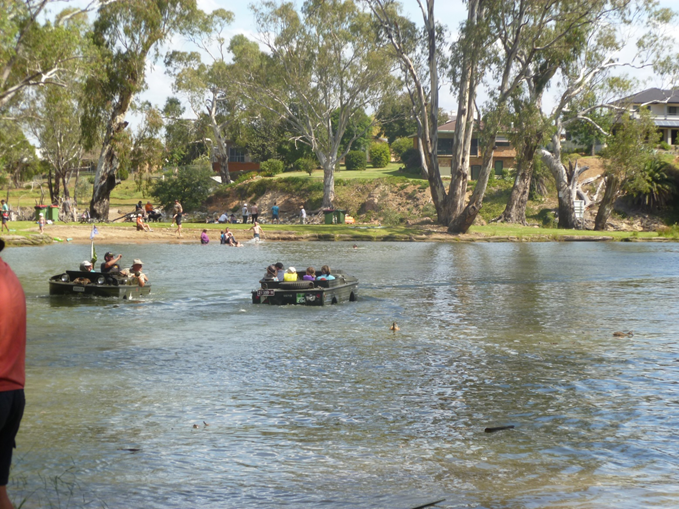 Corowa, New South Wales… a country town on the banks of the majestic River Murray, the birthplace of federation and come March each year, the meeting place for hundreds of military enthusiasts. The week-long event brings vehicles from across the country and allows anyone who’s anyone that has even the slightest interest in military vehicles to exchange stories, wisdom and just get caught up in the atmosphere of Australia’s largest military vehicle gathering. However, this event is not just for the men and boys, I can guarantee that the girls have just as much fun; it’s such a great family event. All held in Ball Park Caravan Park, this is a unique event, where you can wake up in the morning to the sound of a Jeep driving by, followed by a Blitz, and a Dodge bringing up the rear of the convoy. Each year comes with a theme, and 2015 brought about the “Year of the Emergency Vehicle and GM”, and it did not disappoint. It all started on Monday 9 March, with participants beginning to arrive, setup camp and head down to HQ to register. Tuesday 10 March was pretty much the same and with no scheduled activities, the options were endless… you could spend time in the local cafes, complete a bit of retail therapy and/or catch-up with friends you haven’t seen in a year. The scheduled programs didn’t begin until Wednesday 11 March, where many vehicles joined the convoy through the streets of Albury finishing at Hovell Tree Park. Thursday 12 March saw another run but in the other direction, to Yarrawonga/Mulwala, where the vehicles were displayed at Sacred Heart Primary and Club Mulwala as part of the RSL’s 100 year commemoration of the Gallipoli landings. Friday 13 March brought about a run to Rutherglen to visit Gold Battery. On top of all of these planned runs, there were plenty of other things always happening back at camp. Many were wheeling and dealing for parts off the back of trailers like a flock of seagulls, as most of the vehicles that participant in this event are over 70 years old and as the years pass, they have a greater need for constant maintenance. Yet, if you were looking for the ultimate military shopping experience, the place to be this year was “Nigel’s emporium” undercover shopping with carry baskets and merchandised bags and most importantly, EFTPOS. He had everything a military enthusiast would need for restoring his jeep and he even knew what you needed before you did. The place to be in the afternoon though was down at the river lagoon, watching the amphibians make a splash upon entry into the water (great photo opportunity)… this is where I spent my time, getting loads of rides in one particular amphibian and was even lucky enough to take the wheel (Thanks Mitch!!!). The other good way I found to spend my afternoon was taking our jeep out for a bit of off-roading along the river banks, leaving dust in my wake… well, a WWII jeep is the ultimate off-road vehicle, other cars may go faster, but it can go anywhere. When the sunset, you would think that all good enthusiasts would head off to bed, no we stay outside to watch the searchlight beam in the night sky… there was only one complication, the night skydivers, but once they landed, the sky was ours. You may think that already a lot has happened in the space of a couple of days, and you would be right, yet there was still more to come. The main day was Saturday 14 March, with a parade down the main street, vehicles driving two a breast down the road and being lead by the sounds of emergency sirens… it looked and sounded amazing. The fleet of vehicles eventually made their way to the Corowa Showgrounds and Racecourse for the annual swap meet… the place for more wheeling and dealing. Come the afternoon, the only thing left to do was relax by the river before the long drive home the following day, back to work and reality, allowing the countdown to 2016 (“Year of the Tank and Chrysler 2”) to begin. We attended the Clipsal 500 for 5 days. This is the article for Day 1, the Thursday the 26th of February. See below for the others. The Thursday was the first day of the Clipsal 500 open to the public and it was also the School Groups Offer day. We had an 0800 start, with Ray, Terry, Mike, Thomas and Russell manning the display. It was a busy day, with a steady stream of people visiting us and showing a lot of interest in the vehicles, especially the school kids. Feedback from the public was very positive. The rest of the ADF display came together very nicely, with a number of changes made between the time when we left on the Wednesday and Thursday morning, notably, the arrival of Team Army with their Project Digger Ford LTD and Armygeddon Land Rover, which were very popular with the crowds and sounded absolutely awesome when running. The LTD had an issue on the track, during a burnout display, and came back on a flat bed after catching fire. Fortunately the cause of the fire was found to be a leak from the gearbox and no major damage was done. Overall, we handed out a ton of flyers and had a great time interacting with the public on a very nice day. We attended the Clipsal 500 for 5 days. This is the article for Day 0, the Wednesday the 25th of February. See below for the others. It was an early start on Wednesday with Russell, Mike and Terry arriving at the museum at about 0730 to do some preparation and checks on the vehicles, with Terry and Mike in the Mk 5 Alvis Saracen and Russel in the C15A “Koop” Blitz. It was noted that the Koop was a little low on fuel, but Russell figured that it would probably be ok to make it to the nearest service station. Terry wasn’t so sure and insisted that he carry a jerrycan – this proved to be fortuitous, as the Koop ran out of fuel at the intersection of Commercial Road and Salisbury highway. Russell quickly put some fuel in while sitting at the traffic lights and then managed to get the Koop running again, before making it to the BP on Salisbury Highway, where both vehicles were refuelled. At the service station, the vehicles got plenty of attention, as usual, including from a couple of police officers that were there getting their morning coffee. With full tanks of fuel, the vehicles had a good run into the city in the morning traffic and plenty of people were waving and taking photos. The Koop and Saracen arrived onsite at approximately 0945, with no sign of Darryl, Janice and their Jeep, so we made our way onto the main straight for a “PR Shoot”, with the Saracen in pole position, and the Koop in second place… This got plenty of attention and cheering from the crews that were setting up in Pit Straight. After that fun, we moved on to the ADF Oval, followed closely behind with Darryl and Janice arriving in the Jeep. There were a few false-starts to our setup, as the ADF had us move around a few times to make room for their displays, before moving us to a great spot opposite the RAAF tent, next to the sideshows – It had us “with” the ADF, but also in our own area and allowed us to differentiate ourselves from their display somewhat. We moved the vehicles in to place, setup up our tent and were loaned a brand new TV by the ADF for putting on a looping video. We were all set for the start of the event on Thursday and departed at about 12:30.